It’s been two weeks since my last post, and due to a winter storm that has blown through the Northeast region I’ve been finally able to get caught up on some long awaited work and desperately needed rest. After two days of staying hunkered down at home with below 20 degree temperatures, it was long overdue for me to get out and go walkabout. It was a hodge podge sort of day, I knew I needed to visit the horses, but really wanted to go looking for ice instead. Entering into Patapsco Valley State Park, icicles hung down from the Thomas Viaduct. An odd sight as water had seeped through the old bridge stone work. Taking the short trail up to Cascade Falls, the woods was silent except for the wind blowing through the trees. It’s been bitter cold and has left other park visitors away, but the afternoon had warmed up and it was beautiful out. I had recently gotten a new toy to play with and took it with me for its first trial run. This is a crystal reflecting ball that can create a tiny world by refracting what is around it. It’s not an expensive thing and I’ve been looking forward to trying new ways to see things. Mind you..I did say Crystal Ball. Well, Crystal does an amazing job of refracting sunshine through the ball and can immediately sizzle your hand. OUCH !! Ok, so gloves are needed for this task. 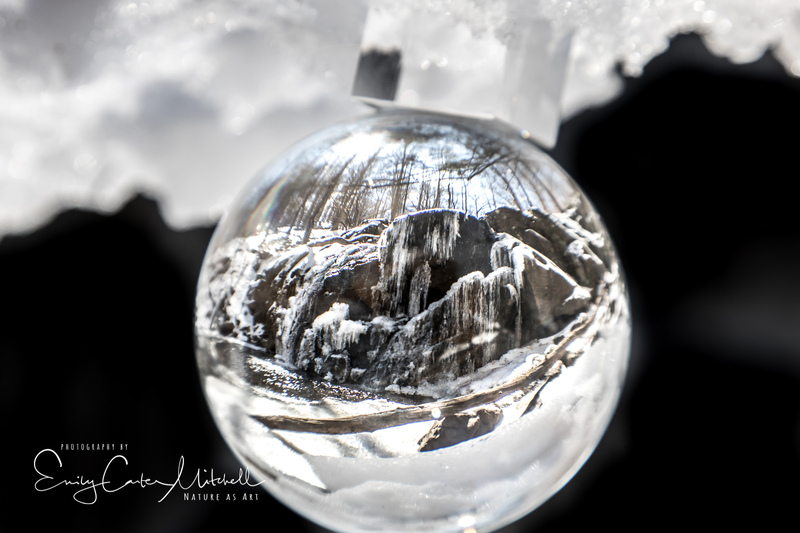 Setting the ball on the little stand included, I used the waterfall and then the swinging bridge as my subjects. Then becomes the discussion as to whether or not I should rotate the image upside down in post processing or not. 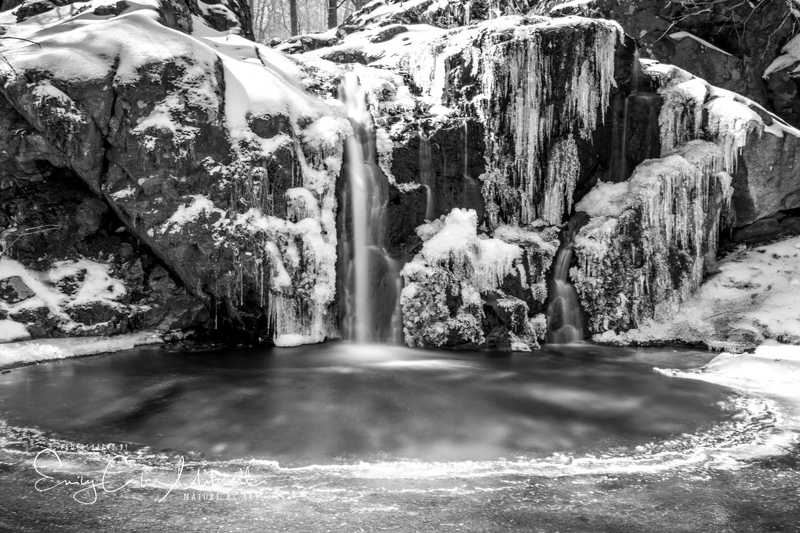 With the waterfall, it made no sense to have the subject upside down, so I flipped the image. But the bridge was much more intriguing leaving the ball upright. From my short experiment with the crystal ball I see that I’ll need to practice with it a bit to get some really nice looking tiny worlds in the crystal ball. But if anything, it’s fun and it’s certainly making me see things differently. 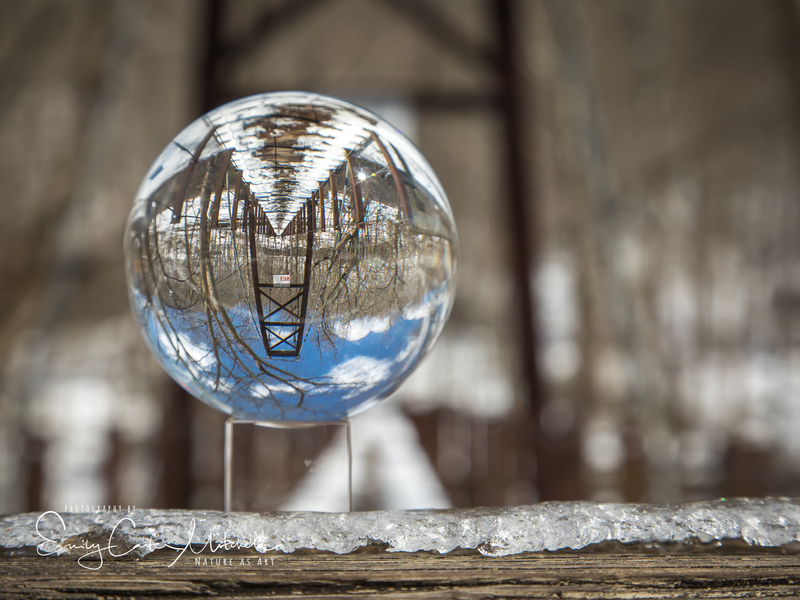 What fun you’ll have with your crystal ball – the upside-down part would do my head in, lol! Wow, what a beautiful photos. I’ve been looking for a prism for a similar effect. I found one, but the store clerk was so rude, I couldn’t buy it there. You opened a big can of worms for me 😉 I went to that link, then noticed all the other ones too. Oh so many choices! I’m sure you might be able to find it in Mumbai. Try an herbalist kind of store. Good luck!